This crowd-pleasing dessert is a combination of crisp meringues, whipped cream, and juicy strawberries! Preheat the oven to 75 degrees C (167 degrees F). Line a baking sheet with parchment paper and set aside. In the bowl of your electric mixer, fitted with the whisk attachment, beat the egg whites on medium speed until foamy. Add the cream of tartar and continue to beat until soft peaks form. Increase the speed and gradually add the sugar. Keep whisking the eggs until they form a stiff, glossy peak. (If you rub a bit between your fingertips, it should feel smooth). Pipe the meringues onto the prepared baking sheet. (I used Wilton 2D star tip). Bake for about 2 hours or until the meringues can easily peel off the parchment paper. Turn off the oven and let the meringues cool completely inside the oven with the door ajar for a couple of hours or overnight. Combine the strawberries, lemon juice and sugar in a bowl. Let the berries sit at room temperature for 30 minutes. Place about half of the strawberries in your food processor and blend until smooth. Keep the remaining strawberries for decoration. In the bowl of your electric mixer, fitted with the whisk attachment, place the heavy cream and sugar. Beat, on high speed, until stiff peaks form. Add the vanilla and whip until combined. Crumble the meringues and fold them into the whipped cream (reserve a few cookies for decoration). Using 4 decorative glasses, start layering the Eton mess. Begin with a few spoonfuls of strawberry sauce, followed by the cream mixture. Repeat as room allows. 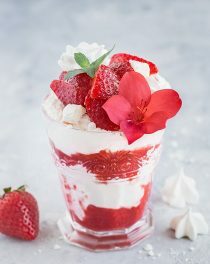 Decorate with the sliced strawberries, a sprig of mint, and a few meringues. Preparation time: 30 minutes if you prepare the meringues ahead of time. Use store-bought meringues to cut down on prep time. Meringues can be stored in an airtight container for several days. Do not refrigerate.